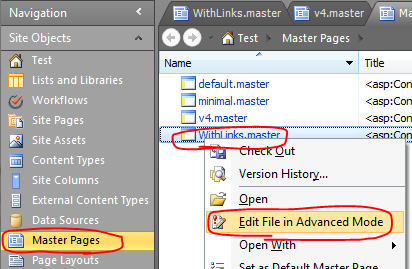 The Top Link Bar (sometimes called the Tab Bar) allows you to include a mix of links and headers (with child links). By default, this results in a single sub menu and handles most situations well. The key attribute can be found on line 355 above. The MaximumDynamicDisplayLevels defaults to 1. Setting this to 2 or higher will control how many levels of sub menus you want to allow. 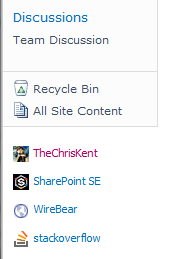 Once you’ve made this change to your Master Page (saved, checked-in, and approved), SharePoint will be able to display multiple sub menus! So even though we made the correct change to the control we have no native way to edit these sub menus. Fortunately this can be done with PowerShell (Or just plain .NET) which will be the subject of the next post. However, this is a necessary first step towards Multi-Level Top Bar Links. It’s not too bad, especially for a simple team site. But with just a little extra work you can have that same list of links display with their favicons and you can move them to some relatively unused real estate – under the QuickLaunch, and on every page in your site. I’m combining these techniques because that was what I did. Fortunately, you can use the bulk of my tips to get nearly any web part to show up below the QuickLaunch. You can also just use the Favicon information to make your link display snazzy. Also, although I’m demonstrating all of this in SharePoint 2010, you should be able to do everything in SharePoint 2007 as well. In order to place a Web Part below the QuickLaunch, you’re going to have to edit the Master Page. There are a couple of options. You can add a Web Part Zone and then customize this area on a page by page basis, or you can do what I’m going to demonstrate: add a specific web part to every page on your site. Depending on your site’s settings, you might have to check it out. If so, make sure you check it back in when done and verify you’ve published a major version so that those without full control can see your changes. Type <br /> and press enter again. Press Save. You’ll get a warning about customizing the page, go ahead and click Yes. 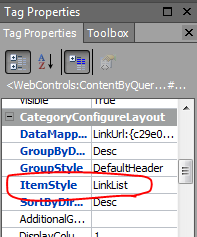 Switch to the Design view and right-click on your new web part and choose Web Part Properties. In the dialog window expand the Query section. Choose Show items from the following list under Source and click Browse… and choose your Links list. Expand the Presentation section. Set Sort items by to <None> (This is to ensure the custom ordering allowed by Links lists is used). 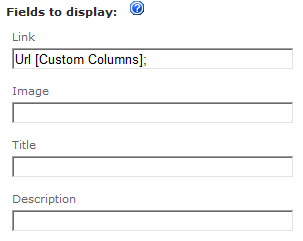 Uncheck the Limit the number of items to display checkbox. The above screenshot is pretty cool. Unfortunately, instead of using the display text, it just uses the link. It also doesn’t open the links in a new window. We’ll fix these issues and add a favicon using some simple XSL. The main changes I made were the additional padding added to the div in line 16 to get everything to line up with the QuickLaunch links and the img element in line 18. The img element uses a special link from Google (found on the Coding Clues blog) concatenated with our link’s URL. 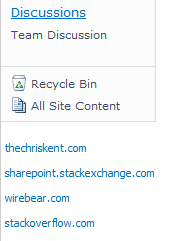 This link allows us to dynamically retrieve the favicons without having to store them within SharePoint or maintain them as links get added or changed. Isn’t that pretty!? Now everyone loves you! This may come up as a requirement when using some of the default templates that automatically include a Site Pages library or if a user adds a new page and is prompted to create the Site Pages library automatically. I assumed there was a setting somewhere either for the library or the site in order to turn off this “feature”. Nope. Somebody decided that this was not only a feature everyone would want, but it was so great they put it in the left actions content place holder (PlaceHolderLeftActions) of the master page – which puts it on top of the quick launch. Some quick searching turned up “solutions” that suggested setting the contentplaceholder’s visible property to false within the master page. This works; however, it also hides anything that uses that contentplaceholder such as some of the Blog tools. This makes it a very poor candidate for a farm wide branding solution. That’s it. Microsoft provided a very handy class just for this section and some quick use of the CSS Display property takes care of it. 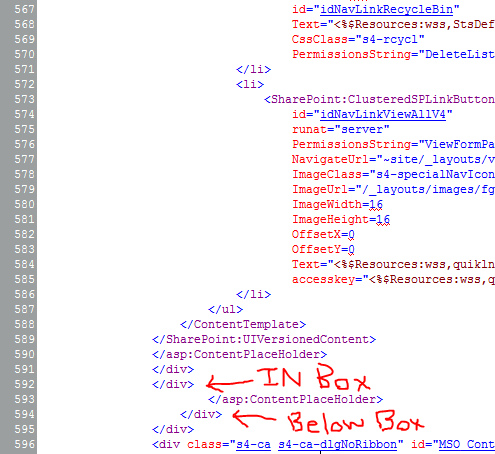 You can also do this in a content editor web part using the same Edit HTML Source option. If you don’t hide this thing, I would suggest editing the master page to at least move that contentplaceholder below the quicklaunch so your navigation doesn’t get all wonky or at least displaced by a relatively unused feature. We’ve been using the MetaData Navigation on a site with custom branding and everything’s been working great. Recently, they decided to remove the Key Filters. This was simple enough using the List Settings but I quickly found that the width of the Left Panel automatically cut off my taxonomy item names without the Key Filters there to stretch it. Users can easily grab the little bar and grow this part of the left panel’s treeview, but why should they have too for initial viewing? Some quick digging in the rendered HTML showed that the Left Panel’s width was set to 155 px by default. All I wanted was to change that to 200 px. Voila! That’s it! The width can still be adjusted by the end user using the grab bar, but the default is set and you are happy. By default, every file you deploy using a sandboxed solution is left checked out. This can lead to problems depending on the type of site you are deploying to and/or the permissions of your end users. This post focuses on Branding solutions, but anytime you are deploying a sandboxed solution these techniques should help you. This is especially important for Master Pages since these often need an approved/published version in order to be visible to anyone but the site administrators. I found an interesting approach by Waldek Mastykarz where he suggests using a “Stamp” (Feature ID property) on each file and using that to find and check in each file. This was very cool, but requires you to modify the Elements.xml entry for each file to ensure that property is added and he also never addressed Master Pages which can be a bit of a special case. If Not WebAppRelativePath.EndsWith("/") Then WebAppRelativePath &= "/"
site.MasterUrl = WebAppRelativePath & "_catalogs/masterpage/BSmain.master"
site.MasterUrl = WebAppRelativePath & "_catalogs/masterpage/BSminimal.master"
site.CustomMasterUrl = WebAppRelativePath & "_catalogs/masterpage/BSmain.master"
site.CustomMasterUrl = WebAppRelativePath & "_catalogs/masterpage/BSminimal.master"
site.AlternateCssUrl = WebAppRelativePath & "Style%20Library/BSResources/BS.css"
site.SiteLogoUrl = WebAppRelativePath & "Style%20Library/BSResources/Images/BSlogo.png"
After gathering basic information about where the feature is being deployed and getting the correct reference URLs, we begin looping through every site in the sitecollection and setting the master page, sitelogo, and CSS settings to use our custom branding beginning in line 11. 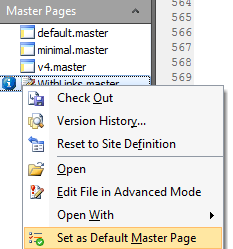 The only thing different than the approach described in the Microsoft article, Deploying Branding Solutions for SharePoint 2010 Sites Using Sandboxed Solutions is that I am checking if the current master page is the minimal.master and if so, using my BSminimal.master file instead. This allows me to have both master pages deployed correctly, but it also allows me to restore these settings more accurately in the deactivating event (See my previous post). To keep things simple, I keep all of my resource files in a single root folder within the Style Library. This makes looping through each subfolder and resource very simple to ensure that each one gets checked in and/or approved as necessary. Lines 29-34 get a reference to the resource folder within the Style Library and pass that information over to a helper method called ApproveAndPublish. This method takes an SPFolder reference and a boolean indicating if approval is necessary or not. For the initial call, the folder is our resource folder and the approval setting comes directly from the Style Library and is found in the EnableModeration property of the SPList object. The ApproveAndPublish method (Lines 55-68) is a recursive function that loops through every subfolder and checks in every file found. If Approval is required, it also marks them as approved. This means you don’t have to track each file (either through stamping or keeping a list). This really cuts down on all the plumbing that is often necessary when working on a SharePoint solution. Unfortunately, Master Pages aren’t usually deployed to a sub folder and so the above technique for approval and check in has to be tweaked slightly. Lines 37-50 take care of this. Basically, we get a reference to the Master Page Catalog and use some basic CAML to isolate our master pages and then loop through them to check them in and/or activate them if required. That’s all that’s required. You now have your files successfully deployed and ready to be used. Be sure to check out my previous post Branding Solution Cleanup. In that post I describe how to remove all of your solution files when your solution gets deactivated. I followed the Microsoft article, Deploying Branding Solutions for SharePoint 2010 Sites Using Sandboxed Solutions and I was able to quickly get the bones of a Branding project put together. Unfortunately, I found that when the solution was deactivated all the files I deployed remained exactly where they were. site.MasterUrl = WebAppRelativePath & "_catalogs/masterpage/v4.master"
site.MasterUrl = WebAppRelativePath & "_catalogs/masterpage/minimal.master"
site.CustomMasterUrl = WebAppRelativePath & "_catalogs/masterpage/v4.master"
site.CustomMasterUrl = WebAppRelativePath & "_catalogs/masterpage/minimal.master"
After gathering basic information about where the feature was deployed and figuring out the correct reference URLs, we begin looping through every site in the sitecollection and resetting the master page to the defaults beginning in line 11. We are just undoing what was done in the FeatureActivating event. The only thing of note is that I hate when a Branding solution replaces every MasterPage with theirs and then just blindly restores v4.master. Mostly this is fine, but if one of your subsites is an Enterprise Search site or anything else using the minimal.master you’ve just wrecked it. Obviously if you know you aren’t using minimal.master then you can simplify this section. Also, I always name my minimal.master replacement in the form [Something]minimal.master to ensure this works out. To keep things simple, I keep all of my resource files in a single root folder within the Style Library. Obviously I have subfolders to organize images, fonts, etc. but all of those are within my one folder. This makes finding stuff much easier, but more than that it makes removing the files super easy – Just delete that folder. Lines 27-33 do just that. 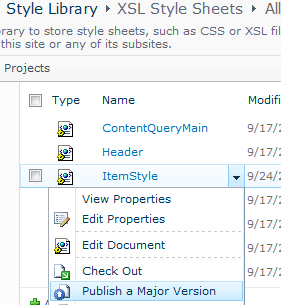 After getting a reference to the Style Library (Every sitecollection in SharePoint 2010 has one of these), grab the folder (just replace the “Style Library/BSResources” string in line 31 with your folder path) and delete. There are lots of guides for deleting deployed master pages and I didn’t find any that worked. Basically every time I tried to delete a master page from within the FeatureDeactivating event I got an error about them still being used. I’m sure there’s a good reason for this (feel free to let me know in the comments), but it doesn’t really matter because as long as you followed step 1 above, it’ll work in the FeatureUninstalling event. We simply grab a reference to the sitecollection’s Master Page Gallery and use some simple CAML to grab references to our Master Pages. Then we walk through them and delete them. That’s it, you now have a self-cleaning solution and you are a responsible member of the SharePoint community.